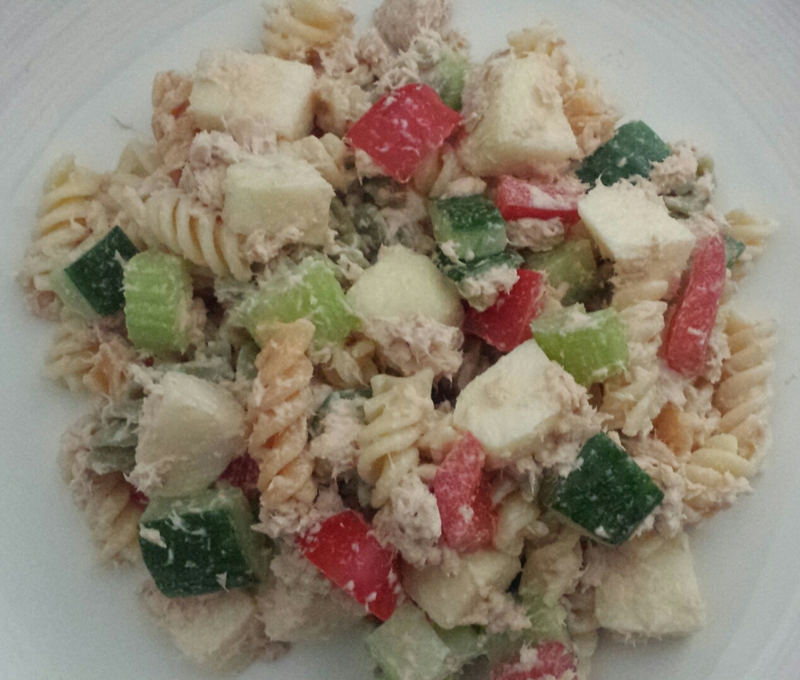 Ok, now I know the picture doesn’t look like something you’d think “Wow that looks amazing” about, but this quick and easy meal is absolutely delicious and is a firm favourite in our house, except with Del who hates tuna and hates sweetcorn and hates cucumber. They say children are fussy eaters!!! It takes half an hour maximum to prepare so is ideal if you have had a busy day. It is especially good cold from the fridge on a hot Summer’s day, and is perfect for picnics and lunchboxes. We are at the start of a heatwave in the UK (finally some Summer!) and this meal will cool you down and make you feel refreshed. It is also healthy with all the fruit and vegetables in it, and a good way to get your children eating more towards their 5 a day. I make a huge bowlful so there is enough to keep in the fridge for the next day. The pear seems to go extra juicy if left overnight. You can serve it on its own as it is super filling, or add a leafy salad on the side. Most importantly, enjoy it! Cook the pasta according to the instructions on the packet, then place into a colander and rinse under the cold water tap until the pasta is nice and cold. Leave to drain in the colander. Drain the tins of tuna and place into a large bowl. Add the mayonnaise and mix well. Add more mayonnaise if you need to, until it is a nice smooth paste-like consistency. Peel the apples and cut into bitesize pieces. Add to the tuna and mix well, making sure each piece is covered to prevent it from going brown. Repeat with the pear. Cut the cucumber lengthways and remove the seeds, then cut into bitesize pieces. Add to the tuna and fruit. Chop the celery and pepper into chunks and add to the mix too. Add the sweetcorn and mix well. Finally add the pasta and mix until everything is covered with the tuna.